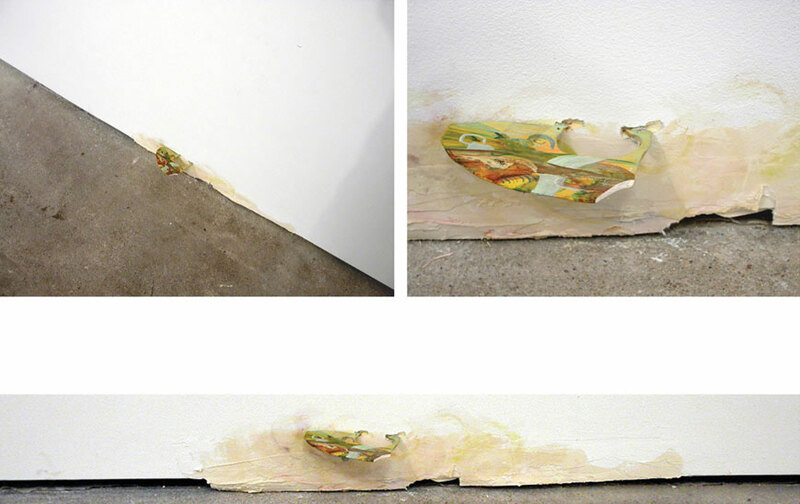 Cumulative Flaw – a 24ftx16ft plywood ramp rising up to 4 inches, painted to match the floor. The central Plexiglas and polymer clay section of the ramp was placed under a leak in the ceiling to amplify the flaw. Depending on the weather outside, the rust loaded water dripped or evaporated leaving behind concentric traces. Areas of the ceiling and walls were also painted to imitate water damage stains to echo this leak. Detail – Cumulative flaw. 2 sheets of Plexiglas (8ft X 4ft), acrylic on polymer clay, water. Details – Cumulative flaw. Day 4 (left) and Day 10 (right). Entrance to installation. Back of constructed wall 8ftx8ft with the rear side of dioramas visible. 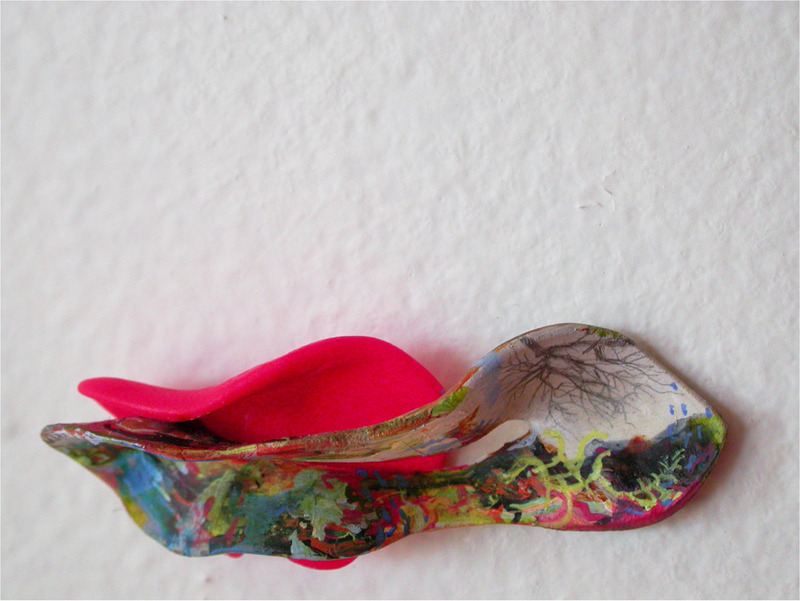 Coffee cup, fungi, tape, polymer clay. 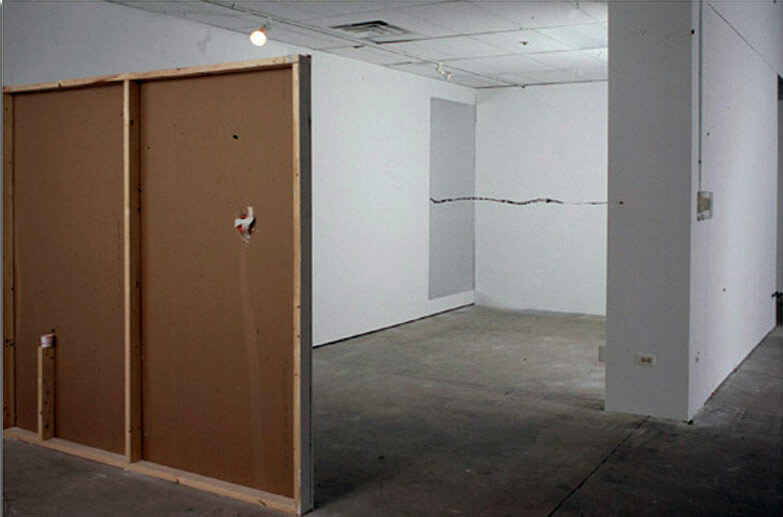 Rift – Cracked wall 13.5ft x 11ft, with 2 parallel mirrors 8ft x 4ft extending the crack to infinity. Greenscape. Polymer clay, acrylic paint- 7 inches x4 inches x4inches. 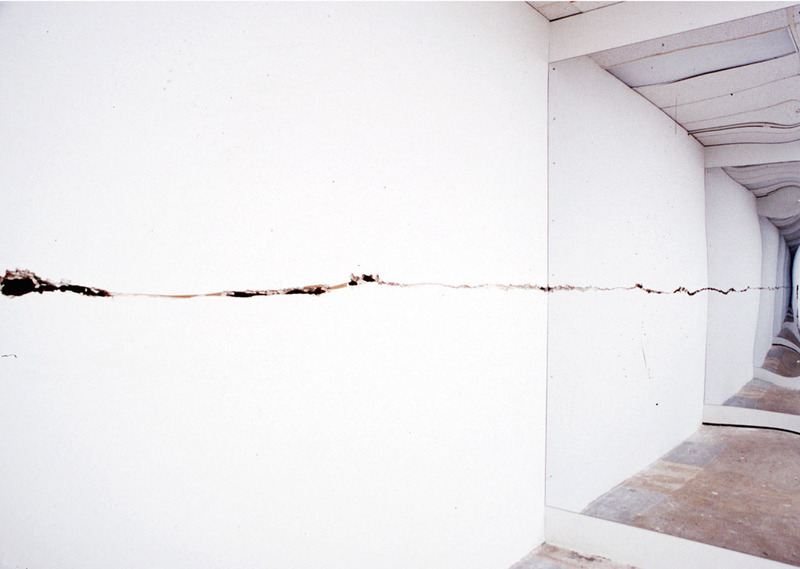 The space between the wall and the floor was extended to create a flaw in the straight line, with tape, plaster and paint. Reflections. 5inches x7inches x4inches. Acrylic on polymer clay, Aluminum, copper wire. 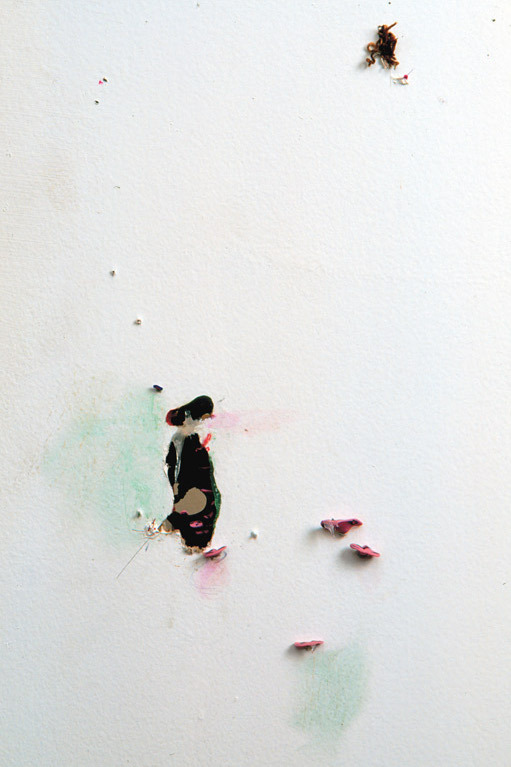 Blade– Layers of green paint covered with white, cut and peeled from the wall.1inch x 0.1 inch. The ceiling and corner, painted to imitate water damage stains. 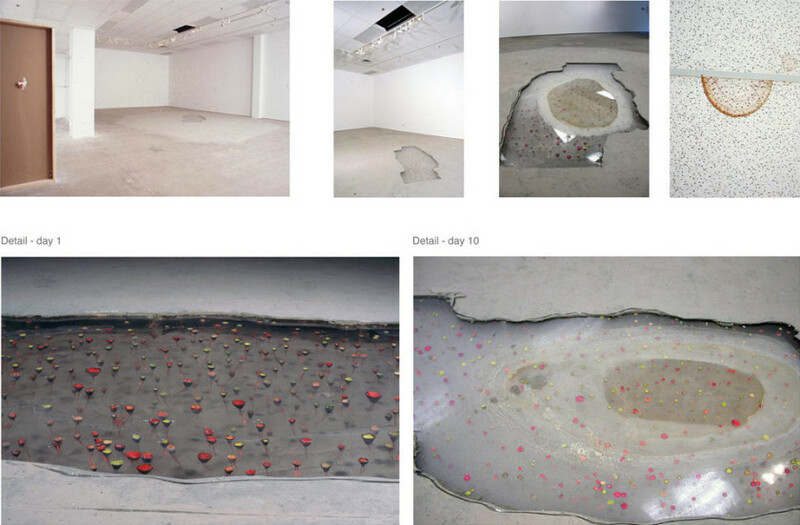 These interventions found all over the gallery echoed the leaking of water from the ceiling onto the central Plexiglas piece – Cumulative flaw. Urban Fungus. Polymer clay, Petroleum jelly, acrylic paint, nails, moss, holes and scratches. 3 inches x 1.5 inches. This is the front view of the intervention,whose back was visible form the entrance. Pinkscape. Pencil and acrylic on polymer clay. 2inches X 1.5inches X 1inch. Floor- Details. Moss, acrylic on polymer clay, colored acrylic gels. Floor- Details. Left -Moss, colored acrylic gels, top right- acrylic on polymer clay in a pre-existing crack in the floor, bottom right- mirror under cut wood. approx 4 square inches each. 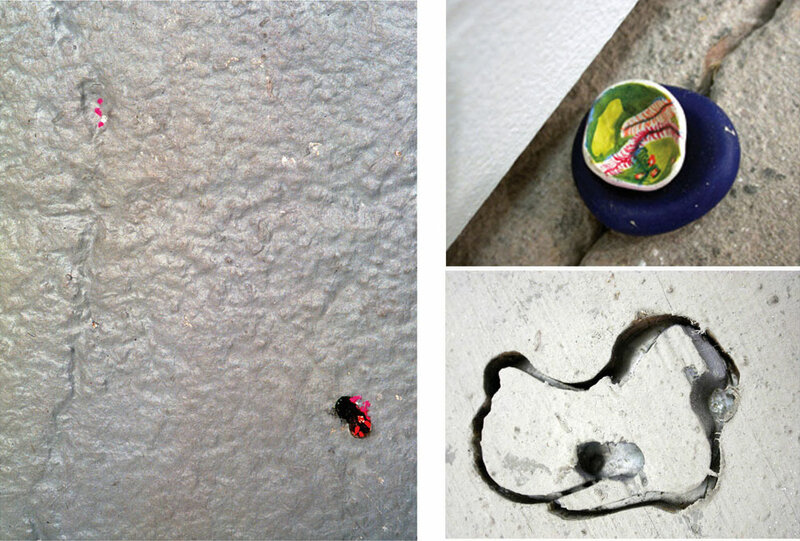 Floor- Details of micro-interventions. Acrylic on polymer clay in a created hole. 2inches. Project Description: The installation consisted of several tiny sculptures, mirrors and plants (embedded in the floor, walls and ceiling), a central floor piece that collected the water dripping from the ceiling and a wall split into two and surrounded by mirrors. Butoh dancer Kazuo Ohno recalls a profound revelation he once had during a performance in the Japanese countryside. Dancing half-submerged in a pond, he looked down at a mirror held in his hands. Algae and bits of dirt kicked up from the pond’s floor floated over the surface of the mirror; past these driftworks, he could see the reflection of blue sky and clouds. In a revelatory flash, he says, he beheld the tiny next to the enormous, the trivial alongside the majestic, the microcosm in its proper kinship with the macrocosm. A shattering sense of the unity of the cosmos hit Ohno hard, shook him to the core. The vertiginous swoop back and forth from the mighty to the miniscule. It is such a sensibility that Sumakshi Singh brings to her Gallery 400 installation. On one hand: the trivial, accidental, cast-off, neglected, broken, overlooked, small, putrescent, finite. On the other hand: the macro, unending, cosmic, beloved, immaculate, grand, infinite. Take, for instance, a single “piece” from her show: whatever it is, it has no clear boundaries, there’s no way to say where it starts and stops, what keeps it from migrating into other “pieces.” (Her show, conceptually, does not stop at the front door of the gallery; look for her “pieces” in your own home.) 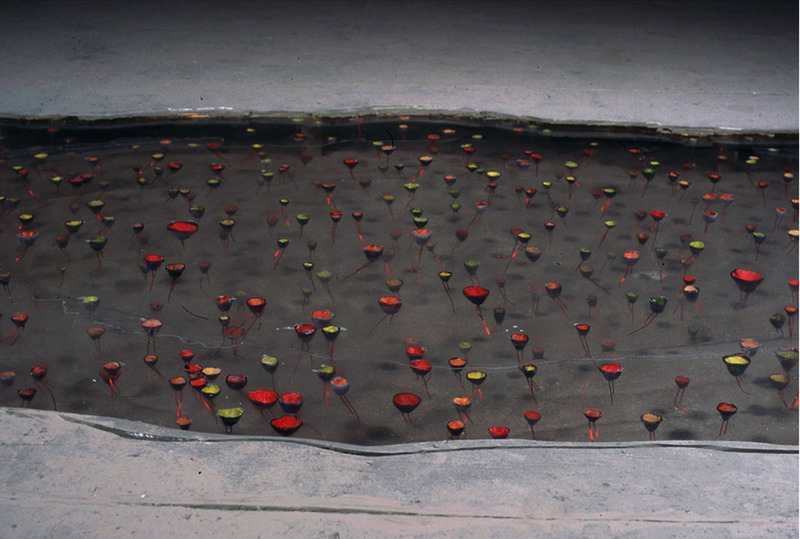 The tidepool in the center of the floor, which collects water and also collects the attention of viewers (the only piece dedicated to this focal task in the show) seems to continue underneath the floor, like an ice-fishing hole or the opening to a geyser. Where does it end? It doesn’t; it continues as far as we can imagine it. The mirrors on either side of a ripped wall create a mise-en-abyme structure, pictures of infinity mapped onto the broken triviality of a crumbling piece of plasterboard. 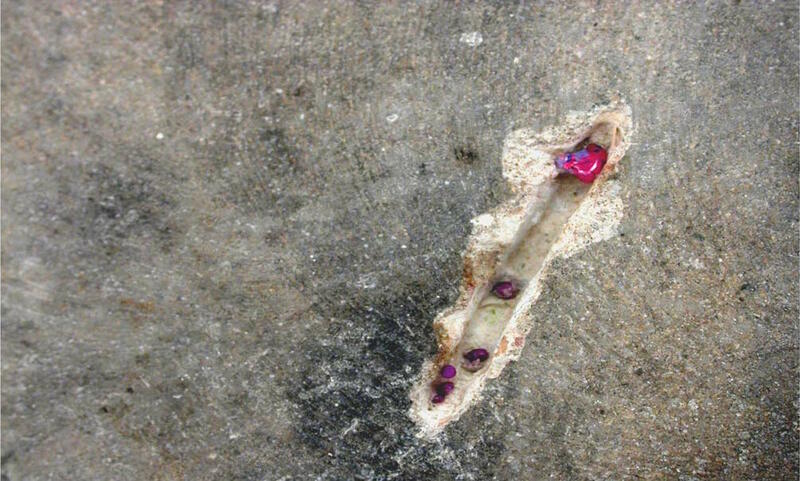 Singh’s wallworks could be taken for mistakes, smudgy fingerprints left by a careless gallery worker, or what she describes as “histories of previous installations.” That is, the marks left on a gallery by activity therein, the inscription of art of the place it inhabits. The “foundness” of these relics, however, is often mythological, producing an unsettling ambiguity: what’s her work and what are the idiosyncracies of the existing space? Singh’s “natural” environs – which evoke walks in the woods and the thrill of discovering whole worlds in the trunk of a dead tree – are constructed, sometimes even designed to lure the audience into a false sense that the means-of-production have been revealed. Take the wall at the front of the gallery, the back of a piece of drywall, which has a casual unfinished and broken appearance that Singh calls “makeshift honesty,” as if you’ve accidentally entered from the rear door of a diorama at the Field Museum and seen the constructed environment as a jerry-rigged construction of two-by-fours and plastiform molding. Is the moth on the wall Singh’s or a “real” moth? Are the fungi in crevices “real” or Singh’s? No matter: they’re both both. Note how she’s painted in the shadows for many of the little outcroppings. Makeshift honesty. 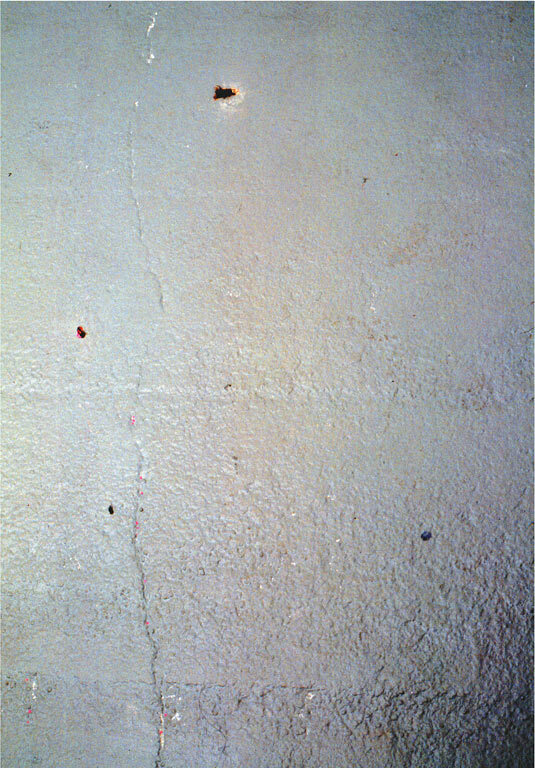 Perhaps the ideal mode of interpretation of Singh’s installation would be criminalistics, the “application of scientific techniques in collecting and analyzing physical evidence.” Fibres left on a wall corner, a crime scene begging reconstruction of a fictitious event. What microcopic calamity could have happened here to produce this? And who’s to blame? These miniscule artworks are the breaking out of the gallery’s lillywhitewashed skin. If they’re playing at the edges of what makes a gallery show possible, at the vanishing point of the gallery (what happens when the work becomes so diffused and spread out that it’s not possible to localize it as “pieces” anymore? 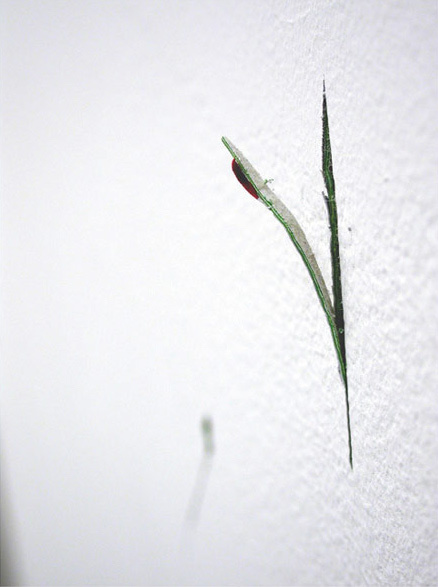 ), then they’re also like the art that grows in as a scab on the perfect surface of the gallery walls after they’re nicked or cut. Sometimes bright, fluorescent, wired, even containing a miniature little design, Singh’s microworlds represent the psychedelic regeneration of the gallery whitewalls, a Tuatura’s tail grown back in technicolor. There’s a hallucinatory aspect to her bright effluvia – the fact that they’re everywhere (or are they nowhere? ), that they beg the question of whether they’re intended or just the scars of some accident, that it’s so hard to tell for sure what is and isn’t part of the installation. They require an obsessive attention to detail, indeed they make the viewer into a temporary obsessive, simply in order to see them. 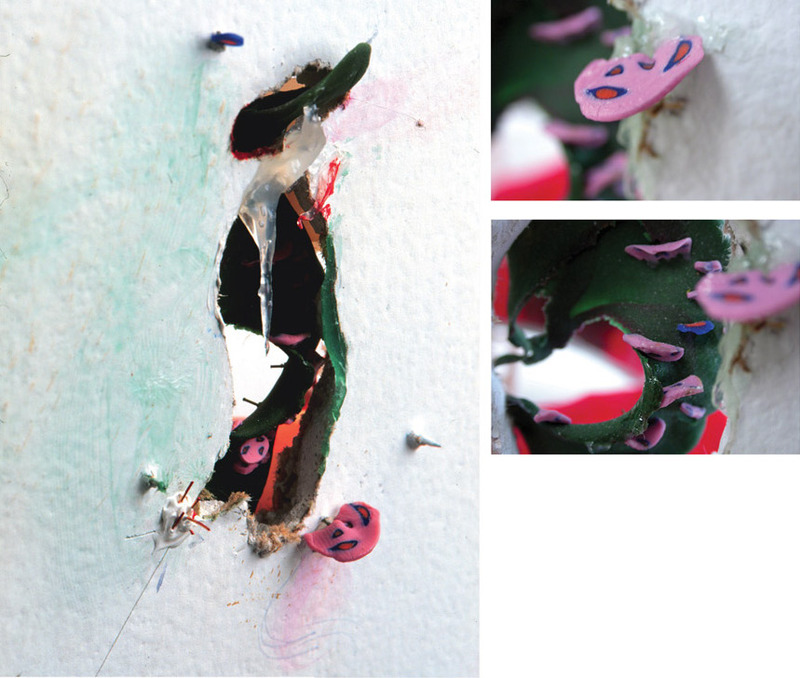 An elaborate hide-and-seek, Easter-egg hunt, the tiny artworks are portals into a terrifying situation in which nothing is clearly distinguished from anything else, the possibilities for categorization are momentarily nullified, and the viewer is left with few options but to scrutinize and contemplate any discontinuity in the pores of the walls. The small becomes giant, the huge space of Gallery 400 is Shrinky-Dinked down to a molecule. We might be forgiven for expecting to see Alice peering back at us from inside one of the little Duchamp-like portals, one wonderland opening onto another. Singh provides a new context for Ohno’s revelation, but one that is meticulously constructed, hidden and revealed in the same gesture. A crime scene awaiting any number of different detectives. But these private investigators can only work inductively, from the particular to the general, not the other way around. The process starts with the detail, the microcosmic, which then is seen as part of the macrocosmic. The heavens reflected in an upturned mirror. A mirror with some strange, colorful swirling fungus growing on it. Infinity discovered on a slice of rotting passionfruit. John Corbett is Adjunct Associate Professor at the School of the Art Institute of Chicago. He writes about music and art and he curates music and art events, most recently a first retrospective of Chicago artist Tristan Meinecke at 1926 Exhibition Space. In 2002, Corbett was appointed Artistic Director of the Berlin JazzFest. His forthcoming book is titled Microgroove: Further Forays into Other Music (Duke University Press). “Void,” an aptly-named exhibition by Sumakshi Singh at Gallery 400, is an attempt to suggest the breadth of the cosmos through a sharp attentiveness toward its slightest details. A brisk glance at the show by a careless viewer gives the impression of emptiness, that there is nothing there to see, except for dinged-up white walls, a cement floor and a stained ceiling in the gallery. Yet—look closer: see the tattered butterfly wing whirling on the sprayed yellow cobweb at the edge of a sunny window; see the tiny, clay lichens and mushrooms painted and then settled into nooks and crannies by the artist; see the finger smudges, the pokes, the dents, the hairline cracks on walls–all teased out of and carefully expanded from the leavings of other exhibitions. Singh’s “art”—such as it is—has an insignificance that suddenly turns on its head and resounds with the infinite. This is art that is almost invisible, forcing the viewer to wonder, where is it, exactly? Is it the tiny lichens, is it the wall cracks, is it that fluff of dust in the corner? From this point of view, the sprinkler system on the ceiling begins to look interesting. There’s a huge crack on a gallery wall with mirrors propped on each end, producing an infinite regression of cracks and imperfections. With these tiny, minimalist and compressed gestures, Singh means us to lose our bearings—we are made to search concertedly for art, any art, within the eccentric leftovers of past activities and empty rooms, and suddenly everything seems potentially to be art. The boundaries and categories that have pinned art to certain media and practices are toppled, and the rest of the world suddenly expands, seems ripe for aesthetic content and teleological meaning. “Void” is part of a wider effort in other ways as well. It is the third in a six-part series of locally-produced exhibitions titled “At the Edge: Innovative Art in Chicago” at Gallery 400, all of which will be specifically created for the Gallery 400 space. This is the second year of the project, which is scheduled to run for at least three years.